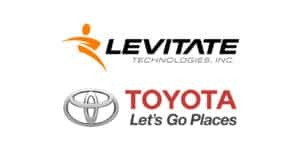 The Virginia Tech Assistive Robotics Laboratory begins limited trials of a passive industrial exoskeleton designed in collaboration with Lowe’s Innovation Labs. 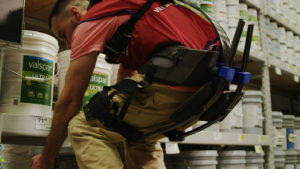 The exosuit is envisioned to relieve the strain and stress on the back muscles and spine on store and warehouse employees working for Lowe’s. Lowe’s is an American Fortune 500 company that operates home improvement and appliance stores in North America with an estimated 1840 locations. Lowe’s is a giant corporation with an estimated quarter of a million employees, many of which perform stocking and warehouse work. If Lowe’s takes a stake in exoskeleton technology, it will forever change the perception of exoskeletons. For now, Lowe’s is only collaborating with Virginia Tech and is performing a very limited, four unit study at its location in Christiansburg, Virginia. Officially, Virginia Tech and Lowe’s Innovation Labs have created a wearable exosuit with lift-assist technology. Essentially, it is a passive back support exoskeleton with some major differences from what we have already seen. Compared to exos such as the Laevo or backX, this exosuit does not use a spring but carbon fiber rods. As the rods bent, they store energy that can later be utilized by the user similar to a spring or bow. A second major difference is that the forces travel behind and not in front of the user. Current passive lift assist exoskeletons utilize a plate or a harness that pushes against the chest. In this exosuit iteration, the chest straps pull up on the user as they bend forward. Most industrial exoskeletons are composed of at least three elements: a frame, an actuator or energy storage module (motor, spring, etc…) and a physical exo-user interface (straps, bindings, etc…). In the exosuit being tested by Lowe’s, the energy storage element is also part of the frame. Fit and adjustability are often brought up as a concern for the practical use of exoskeletons. The Virginia Tech suit allows for the back and leg segments to slide along the carbon fiber rods. It appears that putting on the suit will be as easy as placing a backpack and a belt, as all other pieces can slide relative to each other. Sitting down on a chair with the exosuit appears to be out of the question. How warehouse employees will take their 15-minute breaks is not explained in the initial press release. Many of the passive spring exoskeletons have on/off switches or positions in which the springs no longer exert any force. Carbon rods can’t be deactivated at will. The Virginia Tech exosuit team consists of four undergraduate students, four graduate students and an assistant professor in the Assistive Robotics Lab. The lab’s goal is to develop “a soft, lightweight exosuit intended to reduce the fatigue some Lowe’s employees may experience while on the job, which frequently requires lifting and moving heavy or bulky products…” If you have noticed the emphasis on “soft” and “exosuit” then you might be wondering if there is a connection to the Wyss Institute, and indeed there is! The assistant professor behind this project is Dr. Alan Asbeck, who worked at the Harvard University/Wyss Institute from 2012 to 2015 and was heavily involved with the DARPA sponsored exosuit research there. Hi this is faizan nazir. I want to know more about your exo suit more specifically how much more load a person could lift wearing this suit (a number would be preferred) and its cost of purchase. Hi Nazir. I think it will be best if you can contact Virginia Tech directly with your questions. One thing to keep in mind is that hip exoskeletons are not designed to allow the worker to lift more weight, but to do it safer and/or with less fatigue. In other words, how much load a person could lift wearing the suit should be the same as without it.